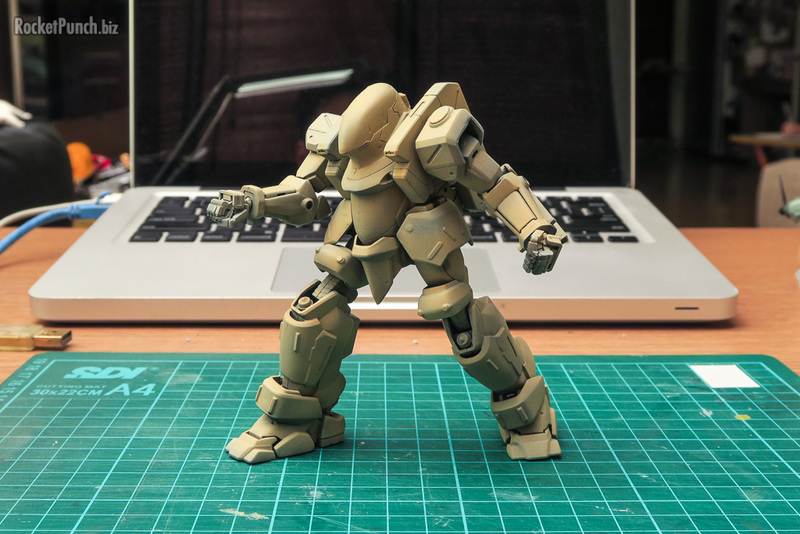 A Tactical Armor (TA) is a bipedal combat machine with artificial muscles featured in the anime television series Gasaraki. The Type 17EX Shinden is an improved model of the Type 17 Raiden manufactured by Gowa Industries. It features better armor distribution and more importantly, a much improved battery system that allows it to operate for up to 36 hours per charge. However, the strain and stress inflicted on the pilot has not been reduced and has proved to be unsuccessful to overcome. 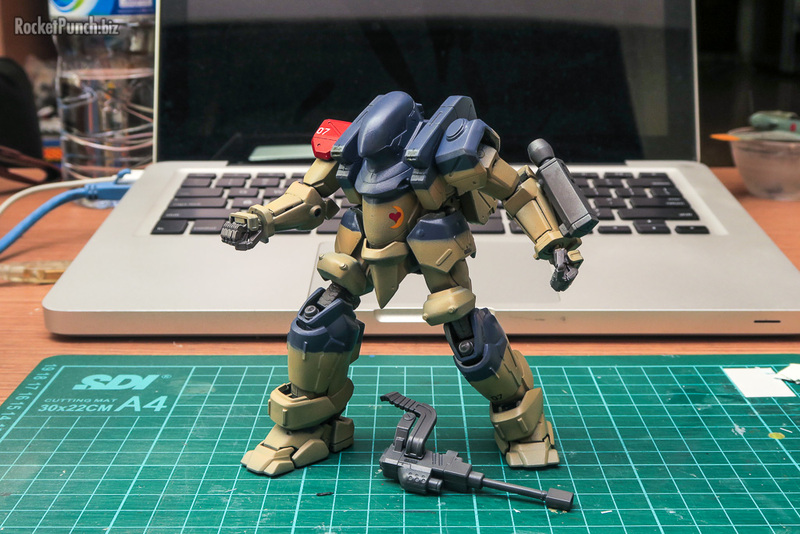 In 1999, to support the anime television series, the Shinden was 1 of 3 Tactical Armor kits issued by Bandai. 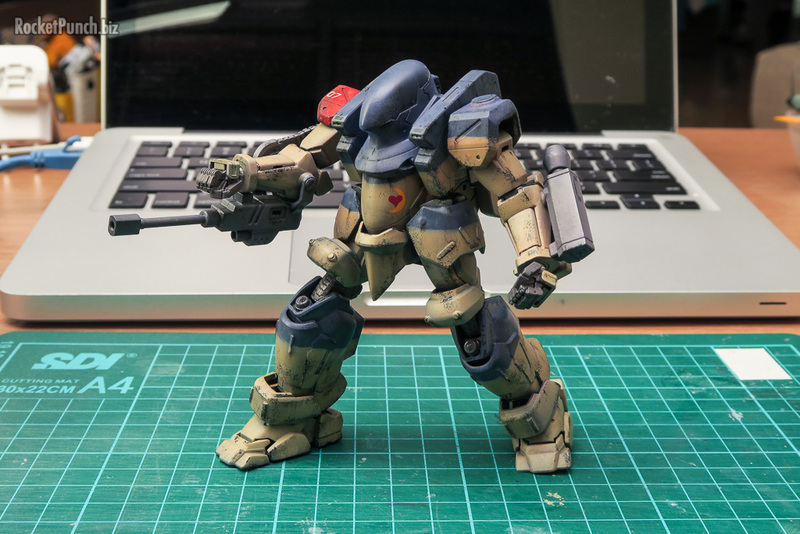 The kits were on-par with any of the Master Grade Gunpla kits of the time in that they featured: complete snapfit build, decent poseability and molding that was crisp and detailed, a plethora of weapon options and even boasted 2 figures (1 standing, 1 sitting). For 2018 though, the kit is showing its age with its lack of attempt to hide seamlines and the decent albeit limited poseability. However, these are still great kits with excellent representation of Shinki Aramaki and Yutaka Izubuchi’s mecha designs. The Masterbox ‘Under Fire’ kit is the continuation in the series of US infantry figures in a modern warfare setting. The kit comes with 4 figures that when placed together tells the story of soldiers providing cover fire while a wounded soldier is being tended to. Each figure comes with its own weapons and pouches which by and large can be swapped around depending on the modeler’s preference. The molding is quite good with nice folds on the uniforms although there are prominent mold lines that need cleaning up. More importantly, the faces are well done and convey the emotions of the figures well. I’ve had the Shinden snapfit together for close to a decade already by the time I restarted it. 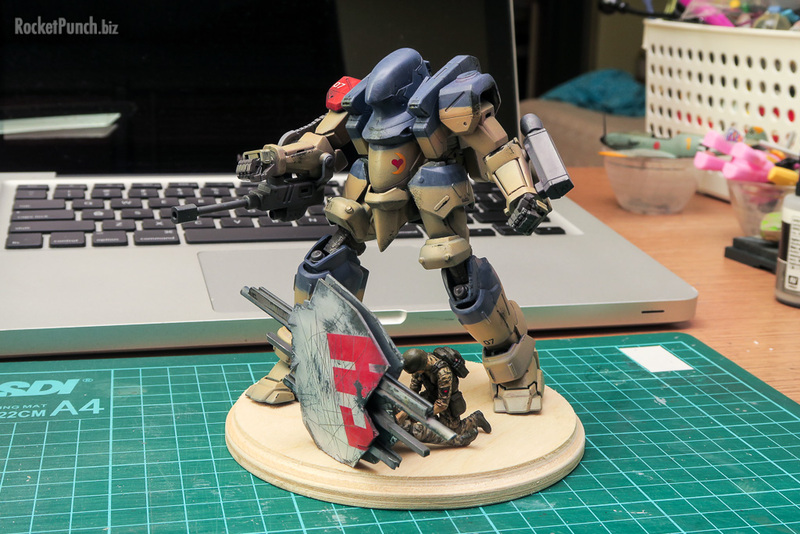 I’ve always wanted to place it in a vignette charging along with some soldiers but I was intimidated with painting figures and the Shinden didn’t look right placed in a running pose. When I saw Masterbox’s ‘Under Fire’ kit it gave me the idea to replace the SAW gunner in the kit with the Shinden providing cover for the wounded soldier. The soldiers would be hiding behind some sort of cover and the setting would be in wacka-wacka-kistan with a desert/semi-arid location. 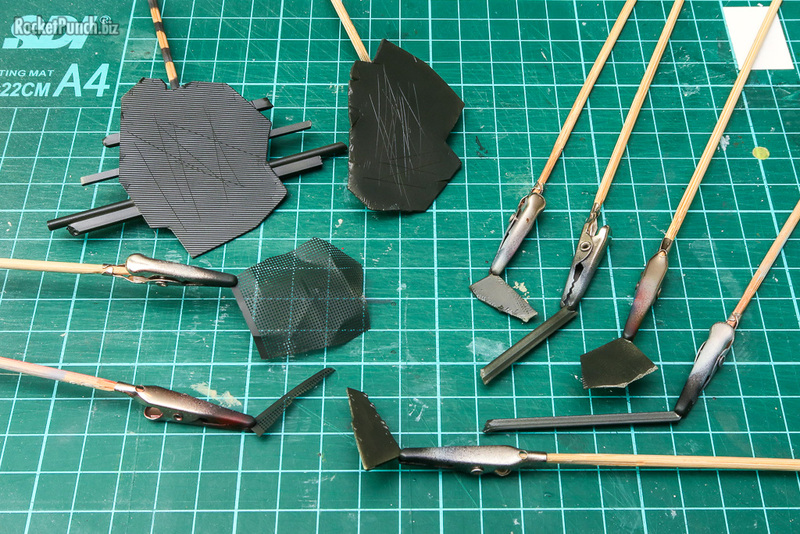 Through the years, I’ve slowly worked on the Shinden by filling the hollow areas in the armor with epoxy putty (a mistake in hindsight) and fixing the prominent seamlines. 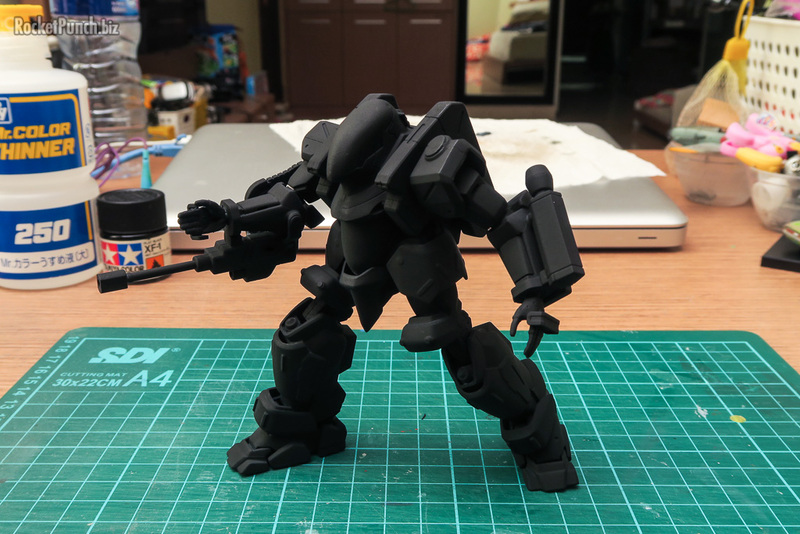 The joints have held up relatively well and while one leg is slightly loose, it can still hold the final pose I had in mind. The kit comes with various weapons for the arms and I went with the chain gun and rocket launcher. The only modification I did on the kit was to replace the open palms with closed fists modified from the Bandai MS Hand 01 set. The figures required some minor cleaning up of mold lines and filling of gaps with putty. Otherwise though, they fit well and look quite dynamic. Since my Shinden is set somewhere that’s not in Japan like the anime, I figure I can go crazy with the color scheme and markings. The scene is to be a semi-arid place so I went with a desert scheme. 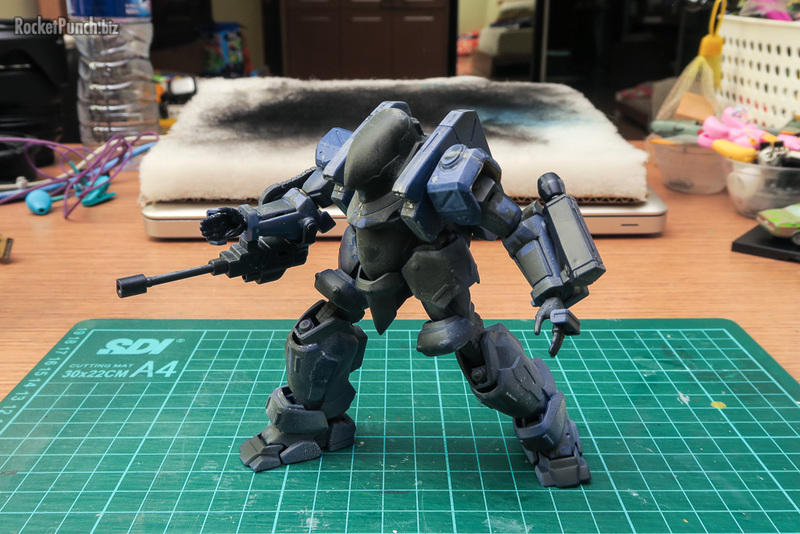 To break the monotony of having the mecha, figures and base in brown, I mixed in a dark bluish gray color for the Shinden. 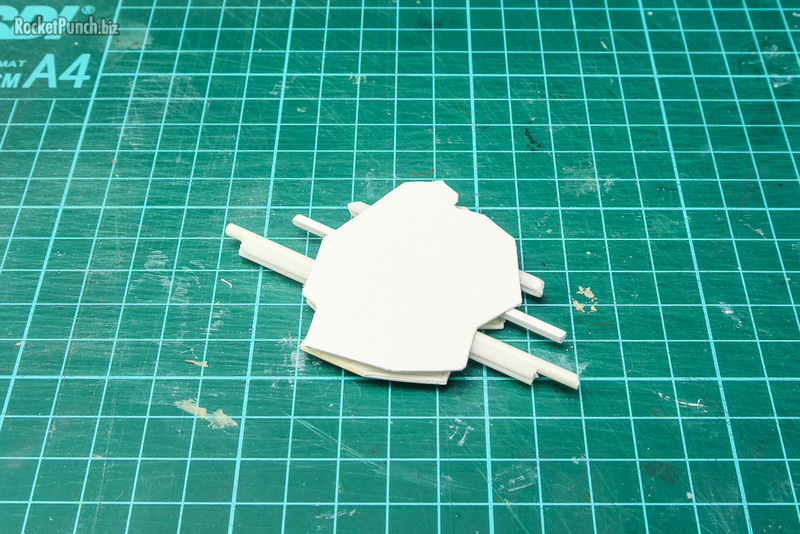 One of the shoulders was painted in red as a unit indicator. 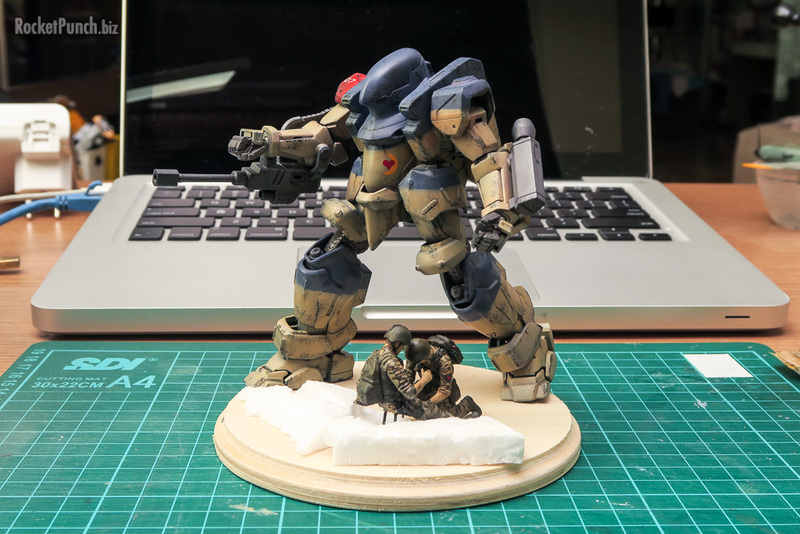 The figures are painted in colors of my own making but it resembles a desertized tiger stripe camo. In a call out to my old Crossfire airsoft team logo, I added some red inverted triangle patches on the shoulders. 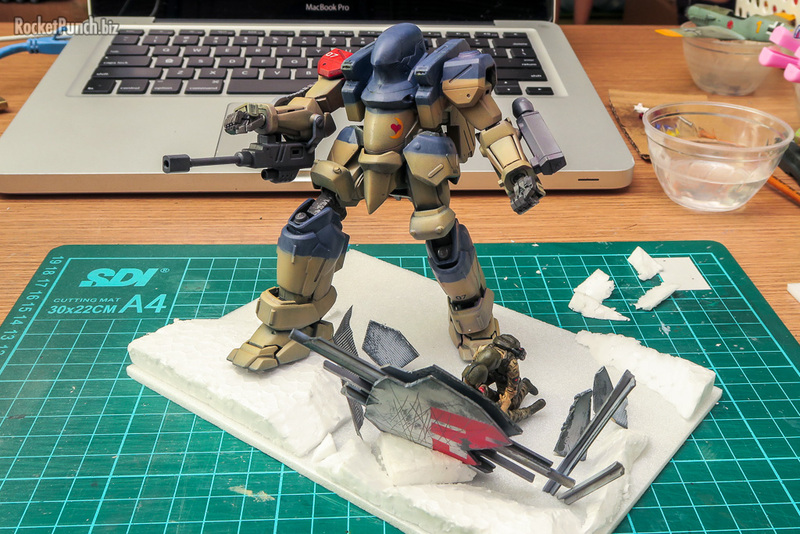 The Shinden was given my by now standard weathering treatment of chipping with acrylic paint. Meanwhile, oil paints were used for washing, filters and streaks. I have to conclude that I really botched the seamline fixing as there are still visible ones in various spots. There’s just too many of them in this close to 2 decade kit. The figures were washed with Army Painter Quickshade which were very effective in popping the details of the folds of the uniforms. This was my time painting whole figures and I think I did a decent job although my work on the faces still needs work: they lack the finesse of the great work I see on the ‘net. The base is cork on balsa. The look of the environment was based on the 2001 film Black Hawk Down. The main cover the soldiers will hide behind is meant to look like a part of an aircraft fuselage that has broken off. I made this with plastic plates and various pipes, I and round beams. 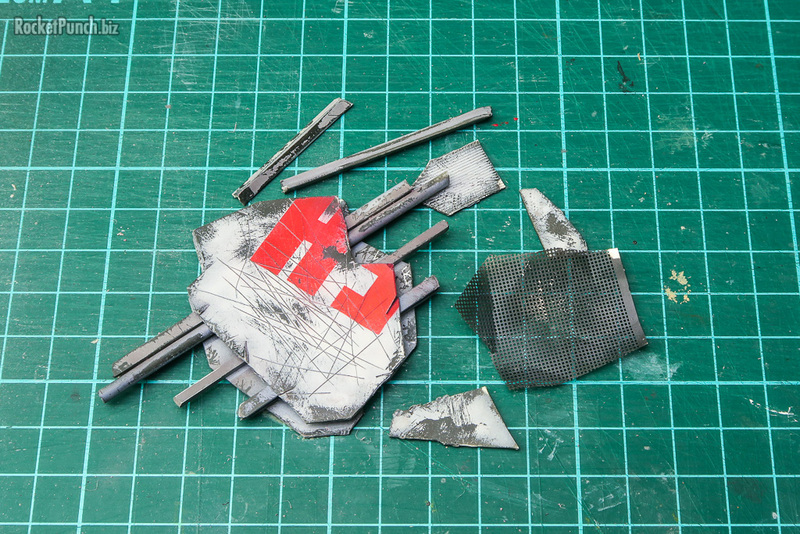 I also added a PE mesh piece and made other wreckage from plastic plates. 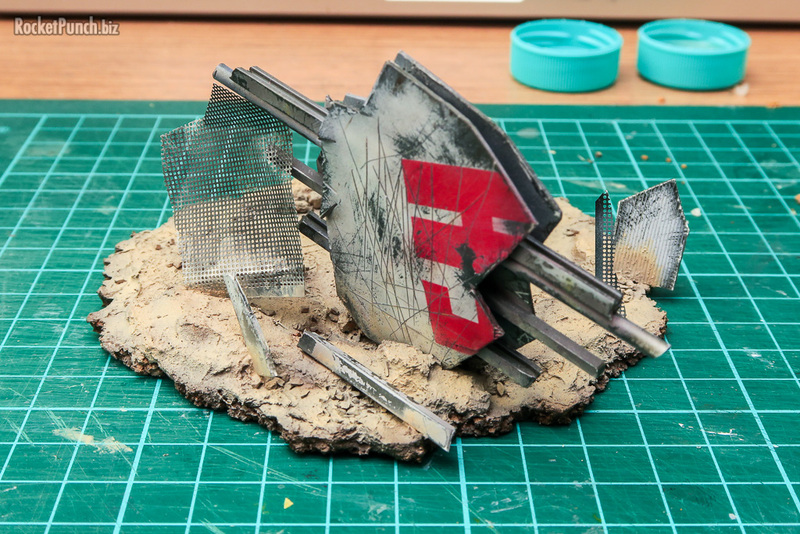 Making the base look damaged and grimy was definitely fun. Work on the base begins with gluing the cork pieces together with a hot glue gun. 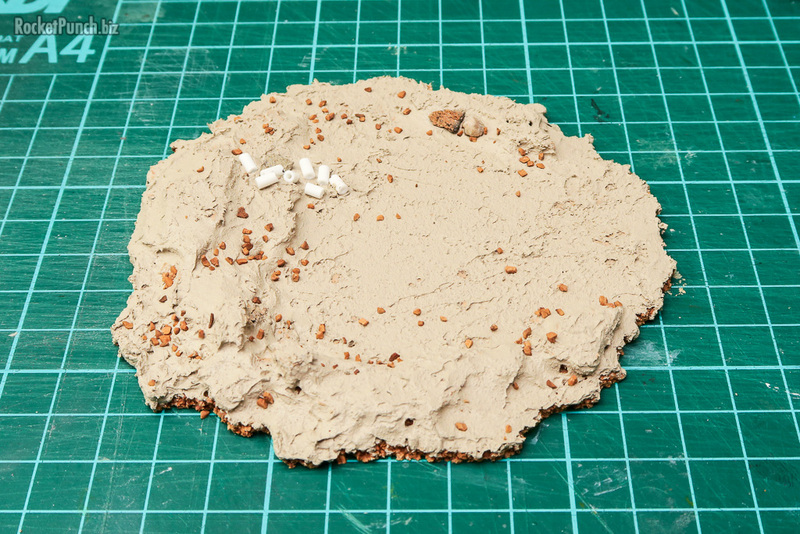 Then I layer the surface with Vallejo Thick Mud – Light Brown. 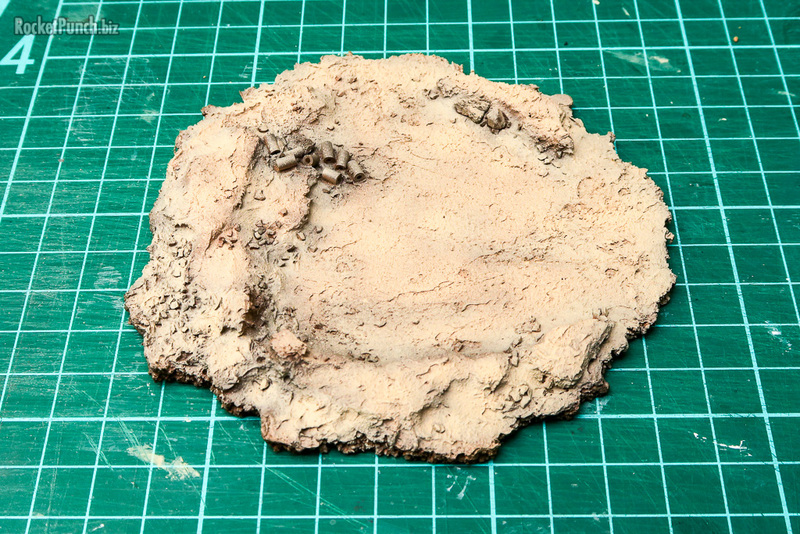 While it’s drying I pressed in a mix of small rocks from Woodland Scenics and my garden. I cut an Evergreen plastic tube in 5mm long pieces and pressed into the groundwork to simulate spent shells ejected form the Shinden’s gun. Logically they’d be ejected further out but ‘artistic license’. Once the groundwork has cured, I preshaded with Model Color Raw Umber. Model Color Iraqi Sand is then sprayed over this. Then the fun begins with gluing the wreckage pieces into place. Once dried, I weathered all the pieces with more of the Vallejo Thick Mud. This was thinned so it doesn’t look as pebbly. 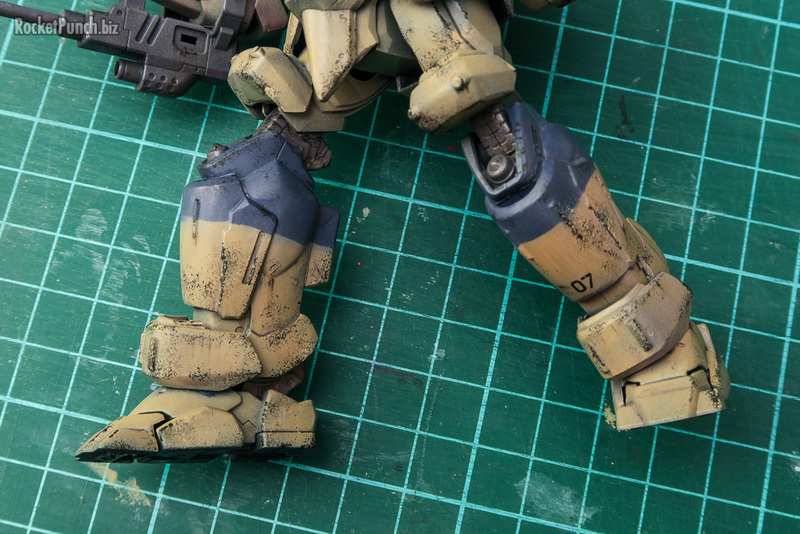 Then, more weathering with filters, washes and streaks with oil paint were done. 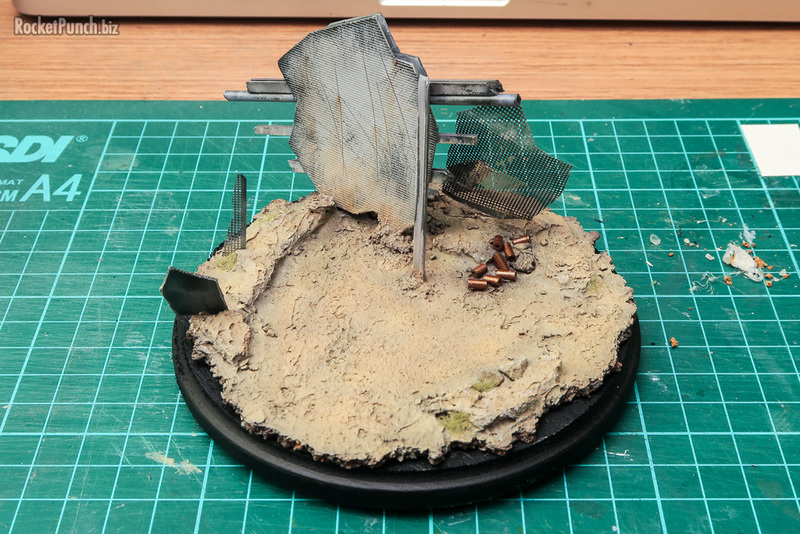 I also gave the ground a light drybrush and added tufts of grass in random spots. The shells were handpainted Game Air Brassy Brass. Up next is attaching the figures and Shinden, slightly weather them further, and I can call this done. 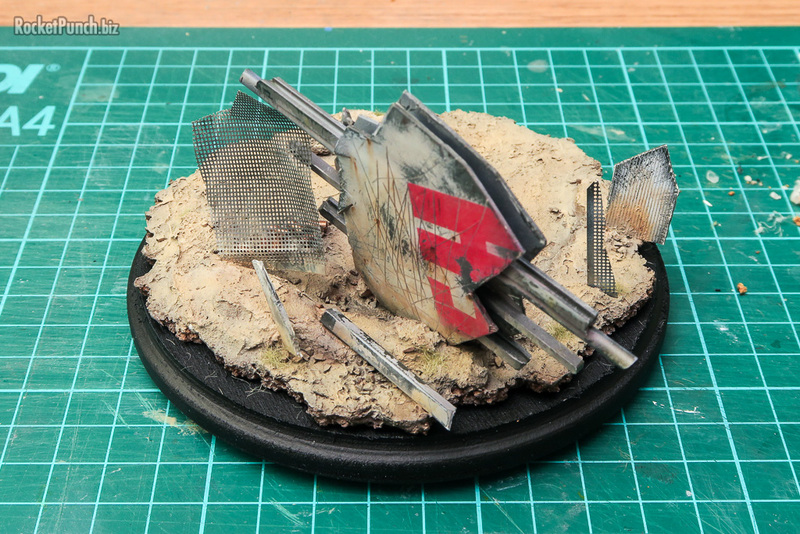 In between painting the Shinden, I started preparing the ruins that will be part of the base. 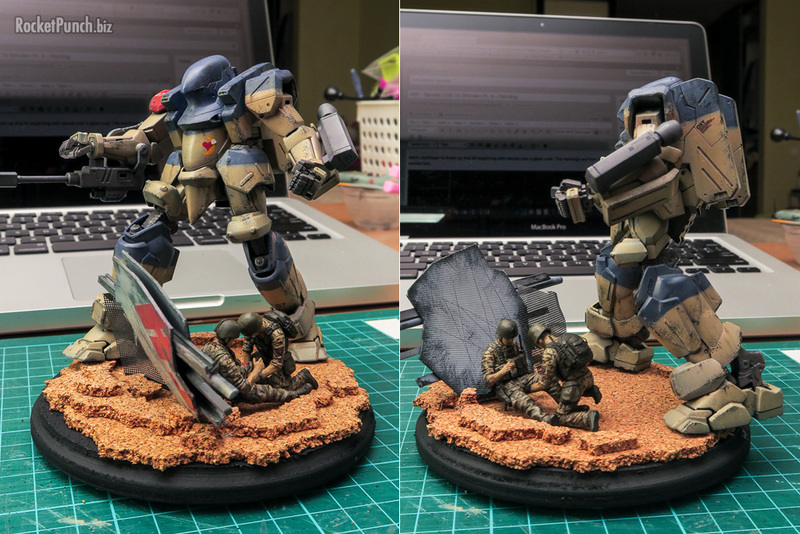 The biggest piece of the base is a cover for the 2 figures to be placed behind. Right from the beginning I imagined this to be a slightly curved piece of metal plate, perhaps a broken piece of aircraft fuselage. I also wanted some of the internal components to be intact. I used some smooth and grated plastic plate, round beams and H beams to build this barrier up. I also made some smaller random pieces of plates, beams and a PE mesh piece to add more visual interest to the base. These were sprayed in black gray and then given a coat of Vallejo Chipping Medium. I scratched the surface and used a pair of pliers on the edges of the main barrier to make it look more beat-up. After spraying the pieces in gray, I added a stencil of partial markings on the main barrier to add even more visual interest. Chipping is easy with Vallejo Chipping Medium added between the paint layers. I used water and a scrubbing sponge for this. I originally wanted a rectangle base using a photo frame but after placing the elements on it, I find that the base was too big and the scene looked static. I then tried a round base instead and I think it looks a lot better. The scene is more compact but also more dynamic. To add some height to the base, I first tried styrofoam cut into random slopes but it didn’t work all that well. 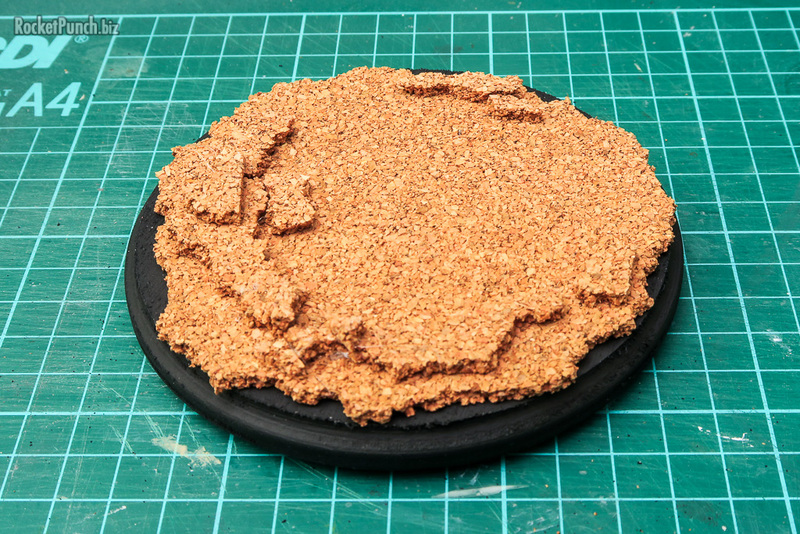 I ended up with using cork which looks a lot better and offers a very easy way to add multiple layers to a base. Once finalized, it’s time to finish up the base and bring everything together. 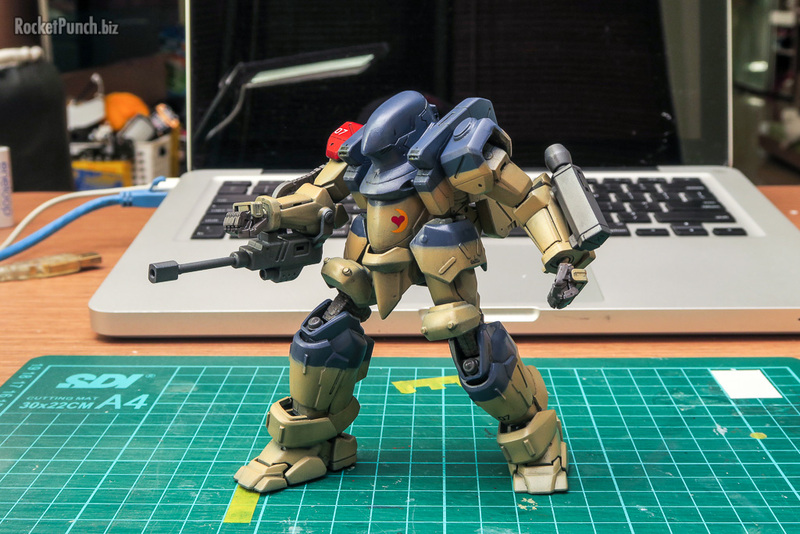 Work continues to finish up this kit beginning with decals over a gloss coat. The markings are from my spares box. After another glossing over, I did an oil wash with lamp black color. I went easy on this wash so it only added some depth to the panel lines. Next, to tie the camo together, I did filters with white, yellow, blue and red oil paints. Once the oil paint has cured, I started doing chipping by handpainting. I then used a sponge for the smaller chips. I decided to go with heavier chipping this time. 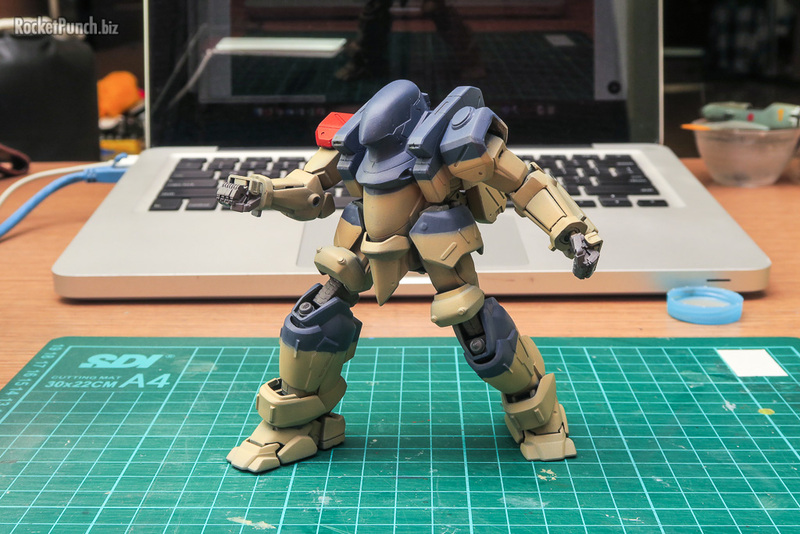 To blend the chips with the base colors, I went back to the same areas and chipped with the base colors. I’m still finding it a challenge to make the chips look random enough. Last on for now are the streaks I added on various parts. With that I’m 95% done with the weathering on this kit. 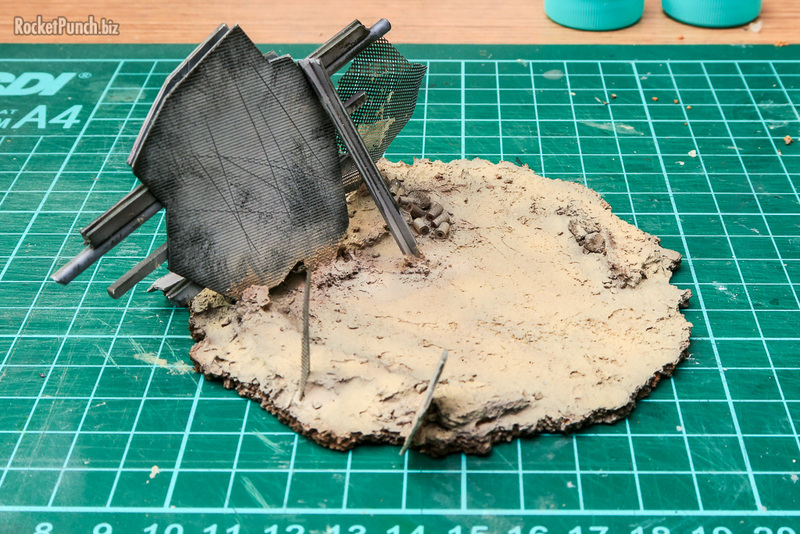 Next up is getting the base done where more weathering will be done to tie everything together. Painting the Shinden is next. 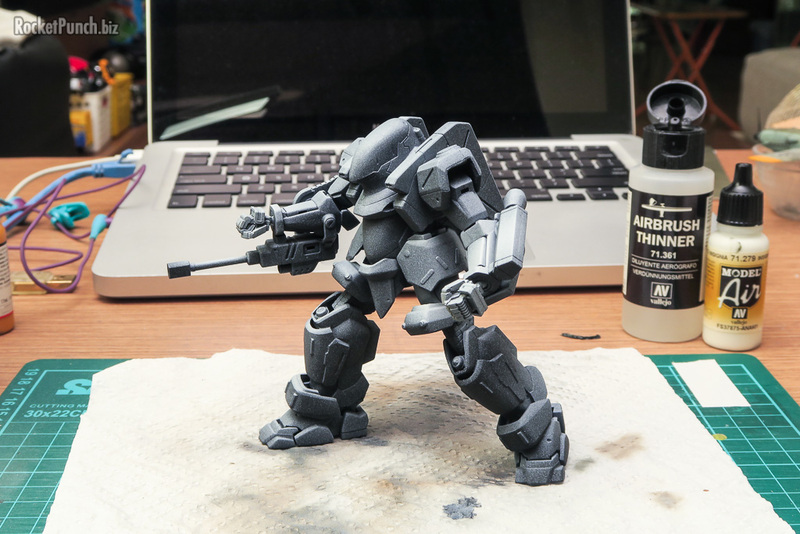 First is priming with black. Then I highlighted with white. Like the figures, I sprayed based on the direction of the the main light source being above. As usual, it’s at this point that still more seamlines turned up which require fixing. 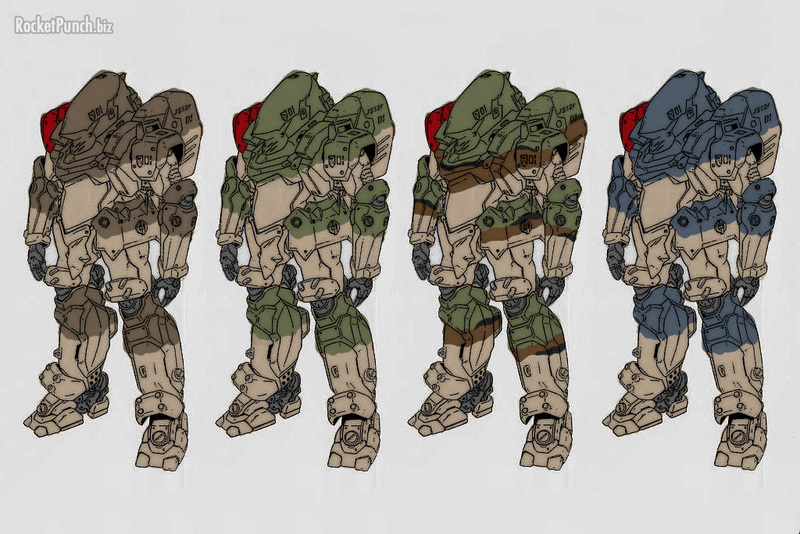 While I go through the tedious process of fixing seamlines again, I spent a bit of time experimenting with the camouflage since I hadn’t really have 1 in mind yet other than it will be some sort of desert scheme. 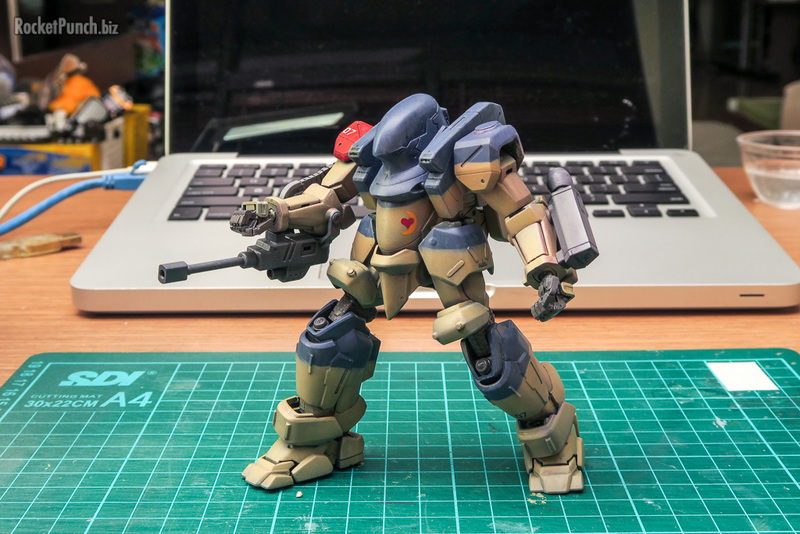 Seamlines duly fixed, I went ahead with the main camo color of tan, in this case, Model Color Iraqi Sand. The color is yellower than expected but I think will tone down nicely after some filters and washes like on the figures. Next up is the secondary camo color using Game Air Sombre Grey which actually looks blue. The demarcation was originally done freehand but didn’t turn out as well as I’d hoped so I went back in with blutack masking and re-did everything. The right shoulder was painted in red as a unit identifier. 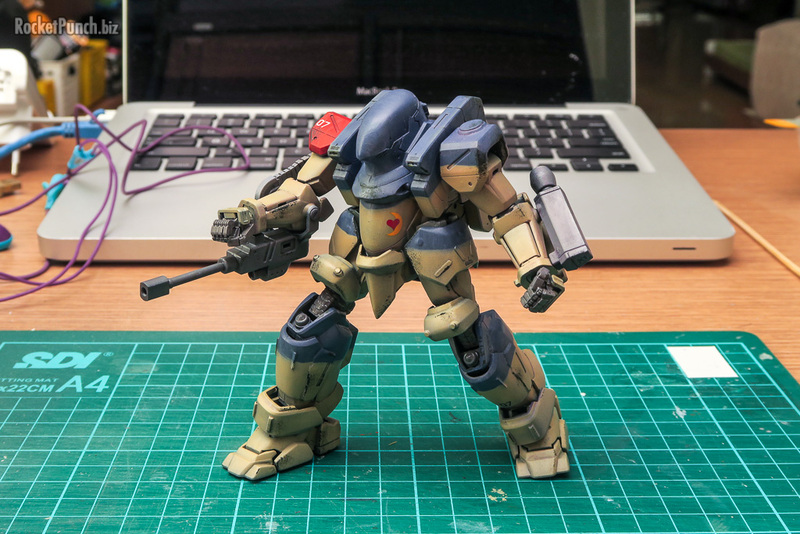 I then handpainted the joints Mig AMMO Medium Gunship Grey. The weapons were airbrushed the same color. 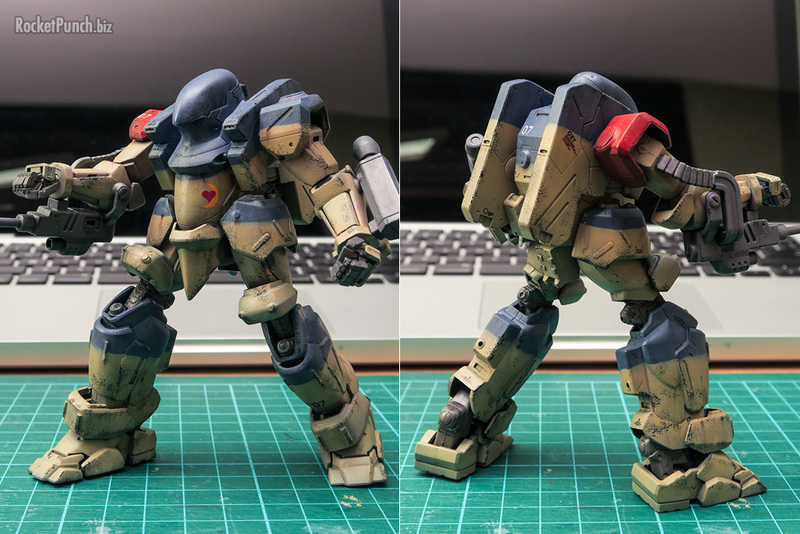 Decals and weathering are next.